I took a trip to the gym this evening to do some cardio. Ugh, it was so warm in there. I was a sweaty mess after my 45 min on the the elliptical – more than I normally would be. Then I hit up the grocery store to grab a couple things I was out of. I’m sure everyone in the store appreciated me and my workout stench glow. I got home just after 8pm, but didn’t feel like making dinner right away, so I did dishes and gabbed to my mom on the phone. Dinner actually ended up being around 9:30. 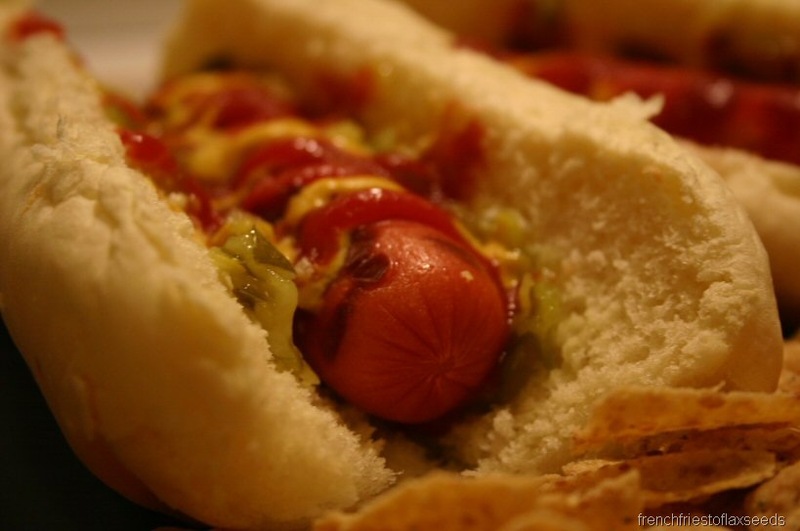 It was a Kelsey inspired meal – hot dogs! 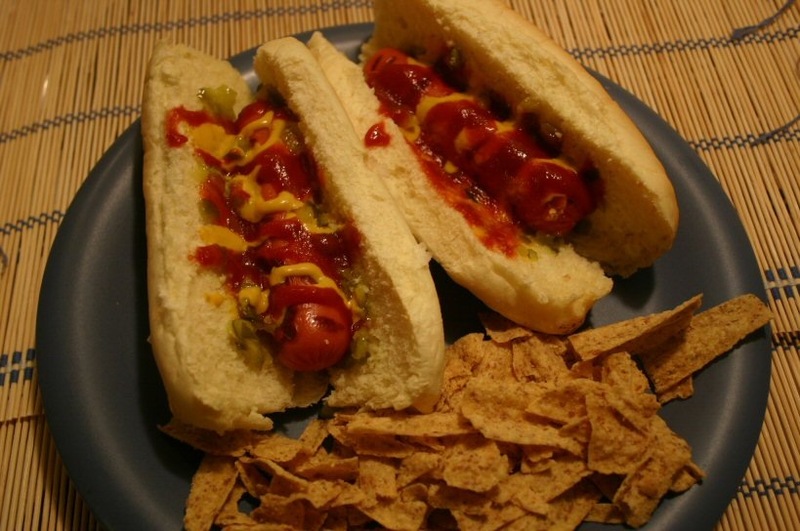 Two turkey dogs on fluffy white buns, with mustard, ketchup, and dill pickle relish. All with a side of French Onion Sun Chip crumbs. Please ignore the hideous ketchup/mustard design. I had some issues with bun placement on the plate for the photo, and it got a little mangled. It’s all gonna get mixed up anyways, right? 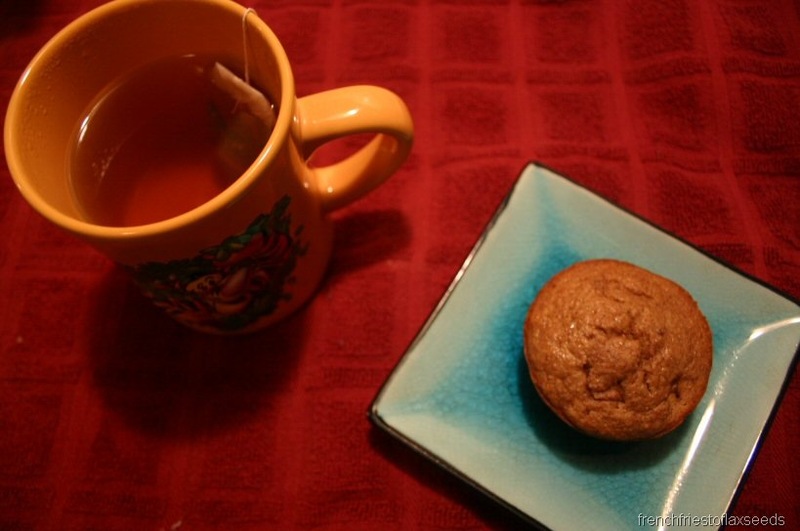 I heated it up in the microwave for a wee bit, to go alongside my mug of Stash Coconut Mango Oolong Tea. The muffin was a lovely treat. I would say the dominant flavour is banana, with the rhubarb playing second string. Still moist after I heated it a little too long in the microwave. Not too sweet, not too heavy. I might just have to try the next one with a little pb for fun. I also love this tea – how could I not, when it has a lovely coconut aroma? Mmm, mmm good. Thanks Krista! But I must be off, as I need to wake up way earlier than I ever want to on a Saturday morning. Night! What a delicious dinner and dessert! Ugh, I hate when the gym is warm! It’s so uncomfortable, and I always feel like I get this weird heat layer trapped right over my skin. I don’t know if you know what I’m talking about (haha), but it’s so icky-feeling! 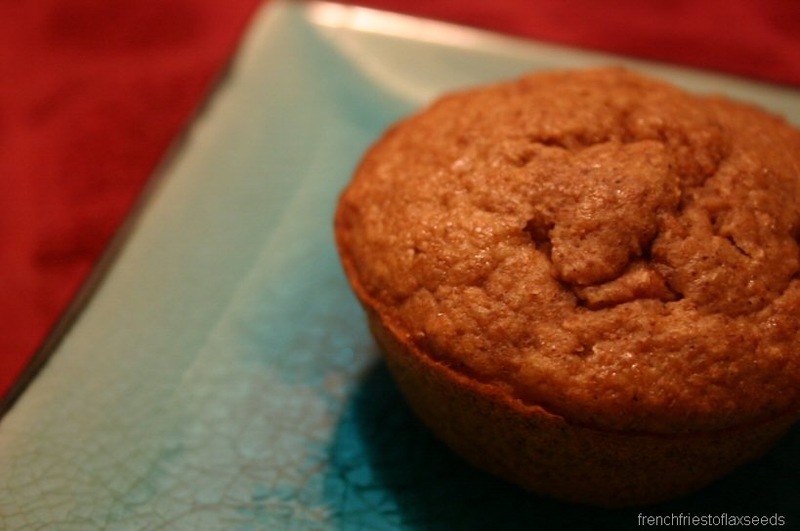 Love your dinner, and the muffin sounds fabulous! Yum. Issues with bun placement – that made me laugh!! Mmmm tasty muffin!! Hope you have a great Saturday! Great hotdogs! And like my Mom always said to me when I complained about the appearance of my food “It’s gonna get all mashed up in your mouth anyways”! Have fun at first aid…. Enjoy your Saturday!!! I’m going to have to get some hot dogs for this week because they’re ALL i’ve been thinking about!!! those turkey dogs look sooo gooooood! That blue plate that your muffin is on looks so much like a little blue bowl I have. They would match eachother perfectly, in fact, the store I bought my little blue bowl at had a very similar plate in the same series. I love it, kitchen utensils are a favorite thing of mine to check out and purchase. Mmm hot dogs. I haven’t had them FOREVER. Such a summer food. And oh so good… I may have to pick some up just for a “treat”.